Published: Mar 17, 2015. 12:14 +0100. This is a topic that has been rumbling on for a few weeks now. First, we had the announcement on the Google Blog that from the 21st April 2015 there will be a Google update that will seek to use mobile-friendly factors as a ranking signal. Then we had John Mueller mention on a Google+ hangout various factors relating to mobile search. Finally, we had the announcement at #smx by Zineb from Google that the mobile ranking update is going to have a bigger effect than Penguin and Panda! So let’s start at the beginning and flesh out some of the detail. But it gets better. 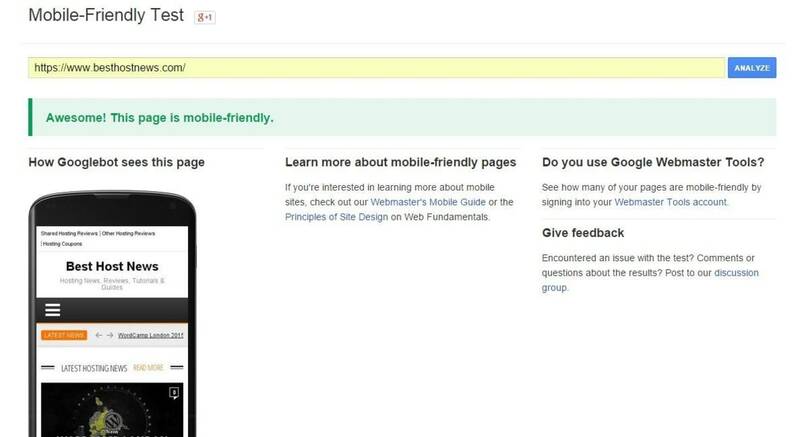 Google have produced a whole Mobile-Friendly websites guide that you can work through here. This contains lots of helpful information and advice, from working with various content management systems, to SEO considerations when implementing your mobile strategy. 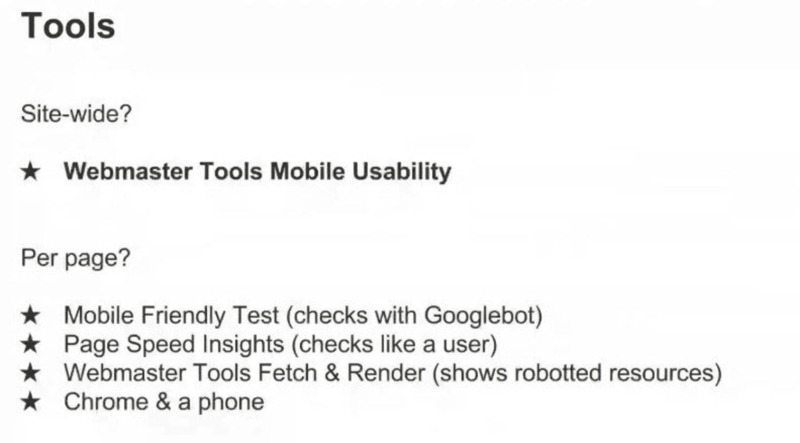 Mobile Usability Report. © Google. As you can see, Google has produced quite a few resources to assist webmasters in getting their websites up to scratch. 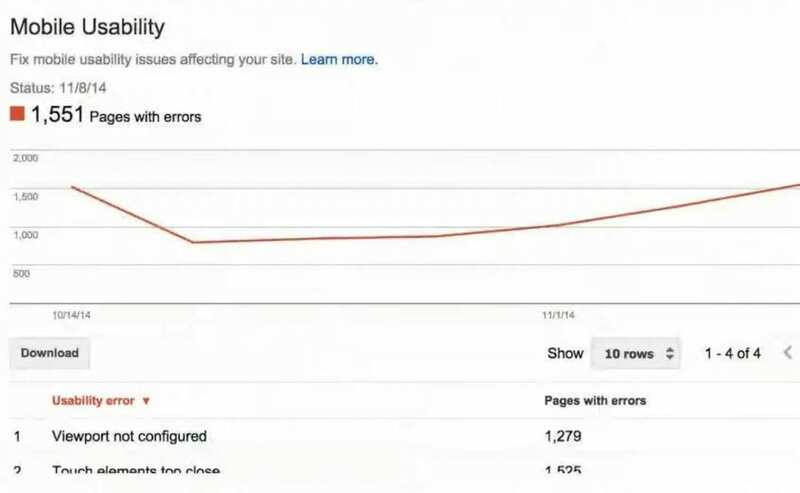 Furthermore, they have specifically announced a date for implementation of this algorithm change to give webmasters plenty of time to implement any necessary changes. To s tart off with, one thing we announced yesterday was that we’re going to start using mobile friendliness as a ranking factor. So if you have a mobile friendly page, mobile friendly site, or if you have an app associated with your site through app indexing, then that’s something that we’re going to reflect in the search results for smartphone users. So to kind of just very, very briefly go through what it is that we do there, I put together a short presentation. I’ll just go through it very briefly. If you want more information, maybe it’s a good idea to look at the YouTube video afterwards, and you can just pause and look at what I have on the slides. But I’ll try to run through it fairly quickly so that we have enough time for all of the questions. So let me see. All right. I think that’s presenting. Mobile users hold a grudge. © Google. So essentially, we’ve seen lots of users love their smartphone. They use them all the time, and they’re unhappy with some of the non-mobile friendly search results. So some people would even go so far as to give up caffeine. I don’t know. That’s kind of harsh. Readable and useable primary content. © Google. 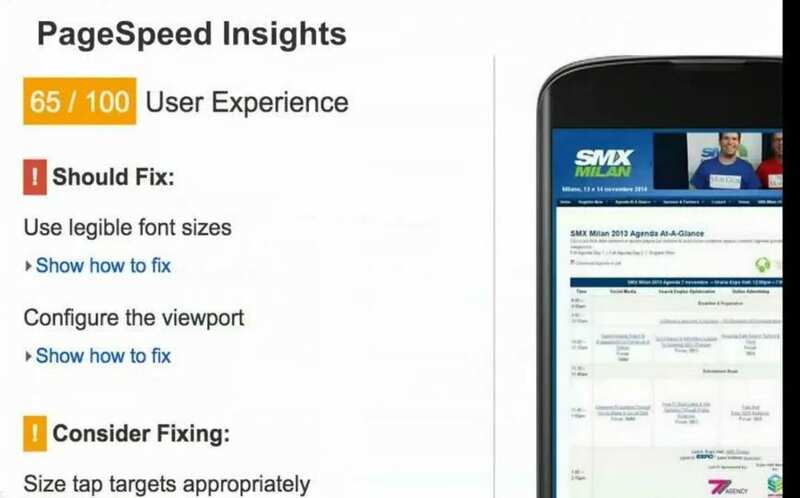 Criteria for pagespeed mobile usability. © Google. 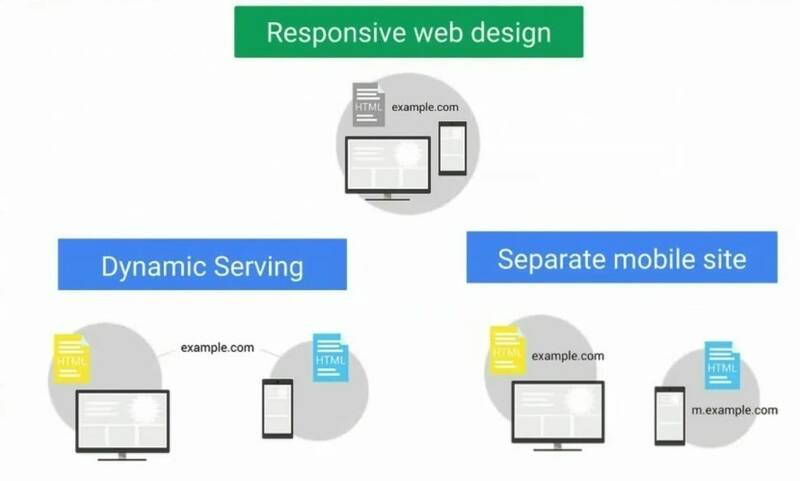 This, very briefly, for the PageSpeed mobile usability guidelines, what we’re looking at at the moment– in general, we have three ways that we recommend of making a mobile friendly website that connects to your desktop site. 3 ways of making mobile friendly site. © Google. On the one hand, responsive web design is where you have the same website, but it looks differently depending on the device. 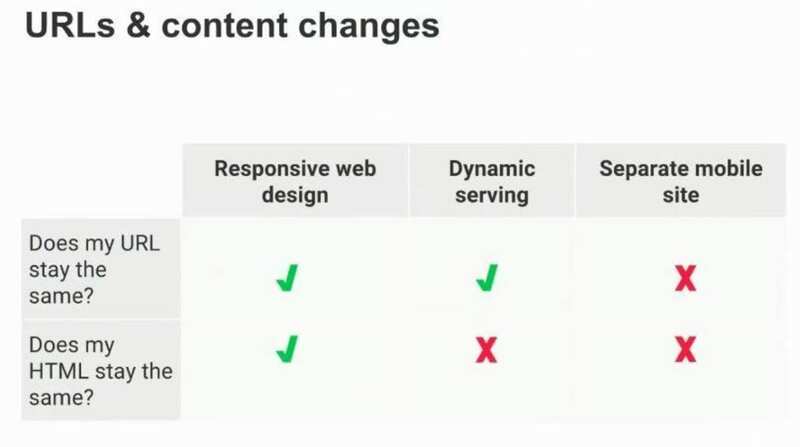 Dynamic serving is where you’re serving slightly different content, depending on the device, or completely separate mobile site. For example, if you have an old website that you can’t update for technical reasons or for financial reasons for a while, you could set up a parallel version of those pages and just connect those pages on a one by one basis. Urls and content changes. © Google. Each of these different options has different ways of handling the URLs, staying HTML or not. From our point of view, they’re essentially equivalent. We don’t treat any of these with any preferential treatment in search, as long as we can tell that they’re mobile friendly, that’s fine. You can check this in Chrome, which is a really easy way to do that if you don’t want to play with your phone all the time. This is a great way to test changes quickly. 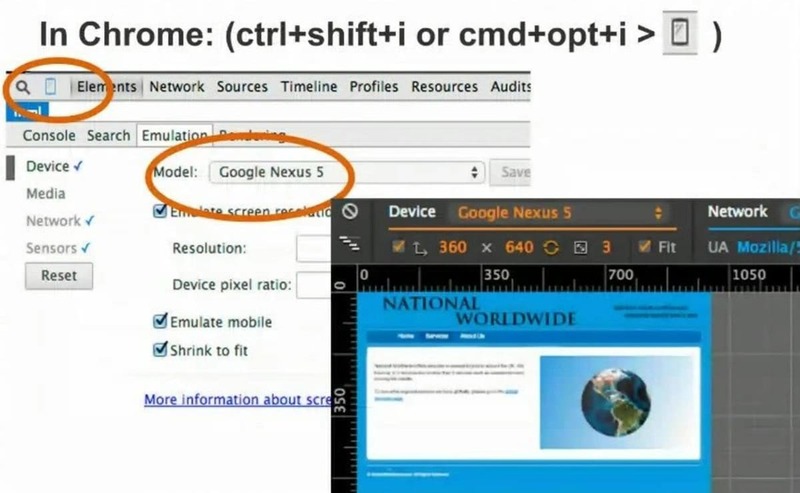 Check mobile in Chrome. © Google. 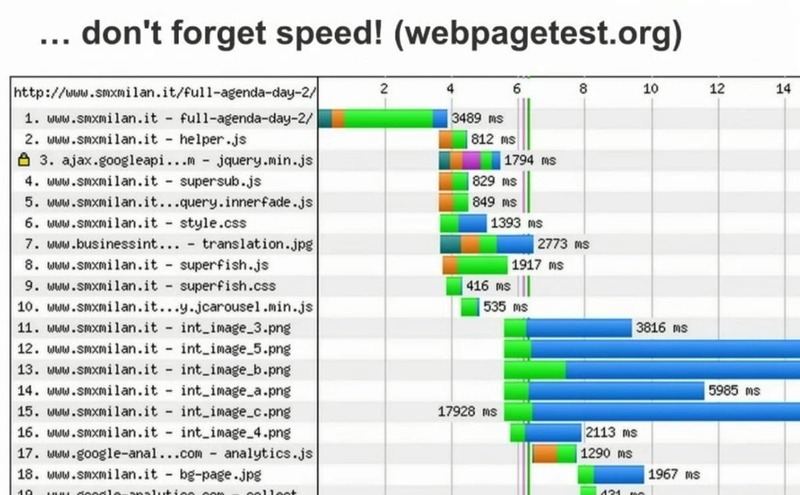 PageSpeed Insights is also a tool that gives you more insight there. Webmaster Tools has some information on how we see the mobile friendly pages. There’s also, in Webmaster Tools, a mobile usability report, which gives you aggregated information on the mobile friendliness of your site overall, which is really useful, because maybe you’re missing some aspect of your site. Maybe you changed all the templates in your CMS, and you forgot one of them, then this is a great way of finding that. So, again, these are essentially our tools. 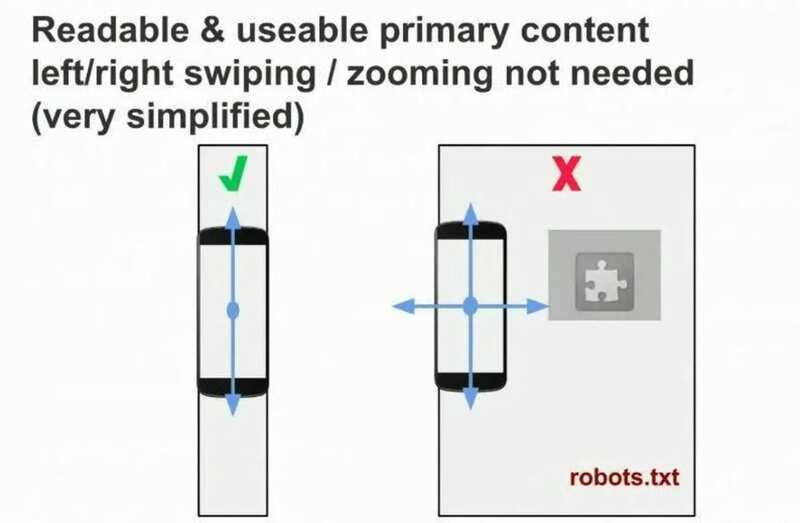 One thing to keep in mind, the mobile friendly test also uses Googlebot and kind of reacts to the robot.txt guidelines there, so it’s a great way to test if something is blocked. Fixing a site that has issues with mobile friendliness, if you’re using a common CMS, then often, there are really easy ways to upgrade that. And sometimes you can install a plug-in that just adds a mobile friendly version. Sometimes you can switch to a more modern theme, for example, maybe in WordPress or in Blogger that automatically has a mobile friendly version in it. It kind of depends. 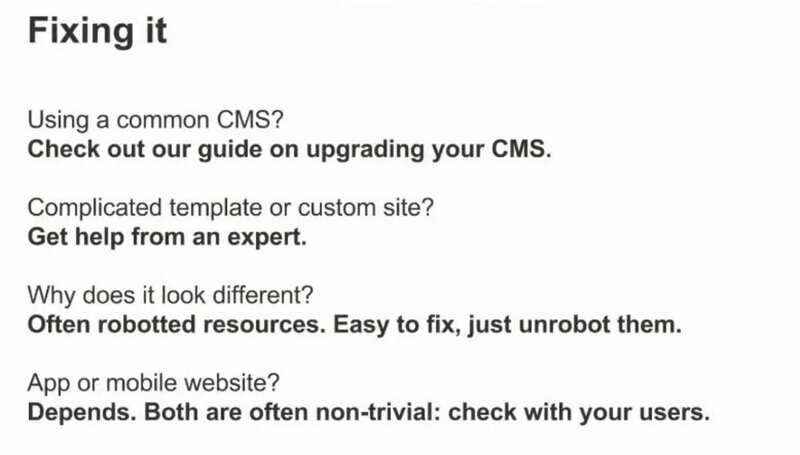 But sometimes, if you’re using a common CMS, really easy ways of fixing that. Google mobile fixing issues. © Google. It can be really tricky, though, if you’re trying to modify the HTML yourself, and you don’t really have a lot of experience with HTML, then it’s easy to sink a lot of time into this. So try to get some help from an expert. 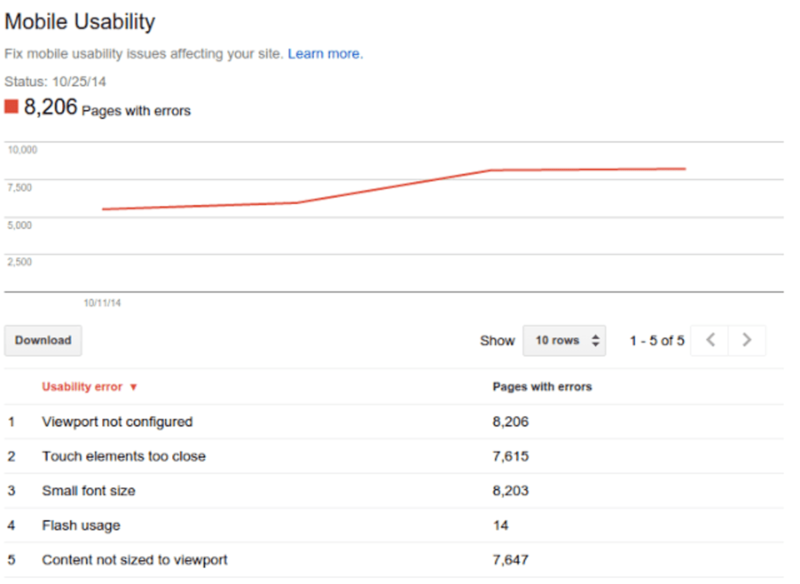 One common feedback we get is that the pages look different in our testing tool than on a phone. And that’s often due to roboted resources. So for example, the CSS is blocked, then we can’t see what this page might look like. And finally, some people prefer using apps. I think that’s definitely a respectable choice. Both of them can be nontrivial to implement. Apps can be really hard to implement properly. So this is not a decision that I would make trivially and just say, oh, I’ll just use apps, and that’s fine, because I like apps. Really check with your users to see what they’re comfortable with. Find out where it really makes sense to invest your time, your money, your resources. I mentioned roboted content a few times. This is really a tricky problem for us, because if we can’t see what this page looks like, we can’t tell that it’s actually mobile friendly, for example. 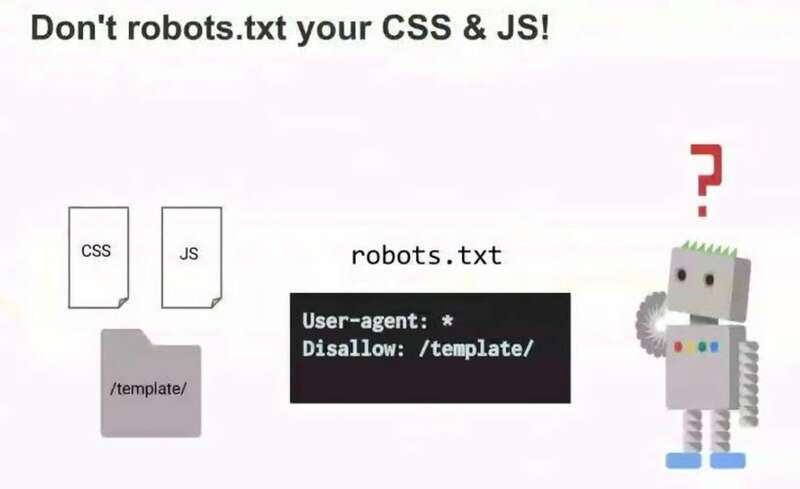 Dont robot your css and js. © Google. 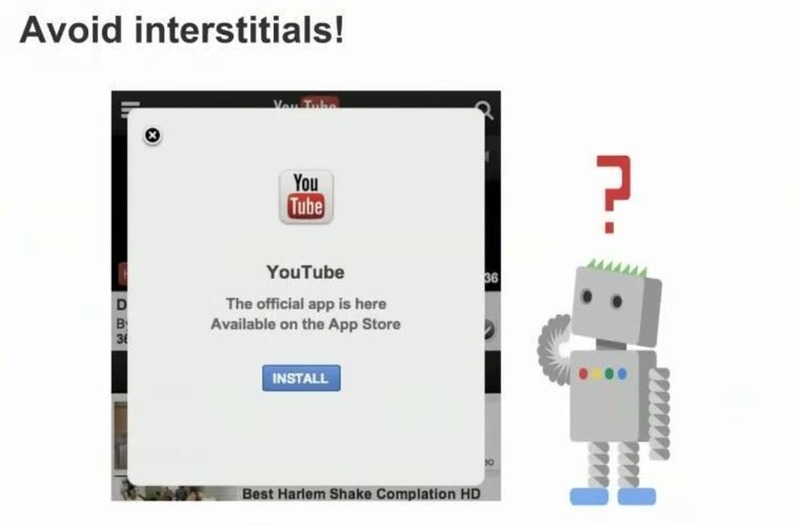 Interstitials is another big problem for us. If Googlebot crawls a page as a smartphone and essentially just sees a page that says, hey, you should install our app, or you should do this, or you should do something else, and doesn’t see the content, then that’s essentially blocking Googlebot from being able to really properly crawl and render these pages. 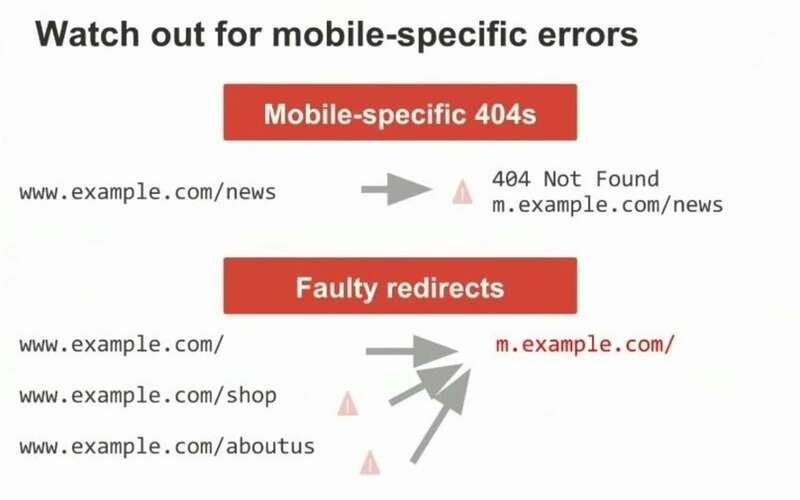 Mobile specific errors are something that we’ve talked about in the past, as well. This has been a ranking factor for quite some time. Mobile specific errors. © Google. Speed is definitely also an aspect that is worth keeping in mind, because depending on how you make your website, this can be quite significant. And on a mobile phone, any additional content that you load, for example, any larger content that you load, takes significantly more time than on a desktop. Speed mobile ranking factor. © Google. So, if you got through the last section … well done. There is an incredible amount of detail which has probably given you much to consider. So, what is the #SMX announcement all about? Well, as we mentioned at the start of this article, Google’s Zineb Ait Bahajji, a Webmaster Trends Analyst said at SMX Munich earlier today that the mobile search update will have a bigger effect than Penguin and Panda! So how big will this update be? To understand that, we need to look back at how big the recent Penguin and Panda updates were, which is about 4 percent and 12 percent respectively (stats via Seroundtable). We then have to consider that mobile searches only make up around 50 percent of all Google searches and that this update is specific to those mobile searches. Therefore, for the mobile search algorithm to be bigger than either Penguin or Panda, we must be looking at some very significant movement indeed. Well, considering we know approximately when the update will hit (21st April 2015) we won’t have long to wait. If you haven’t already, we suggest you implement some of the suggestions in this article and test your website for mobile friendliness!